Will the fire ever go out? Bible says Psalm 37:10, "For yet a little while, and the wicked shall not be." But the wicked shall perish, and the enemies of the Lord shall be consumed; into smoke, they will consume away.” Again, Isaiah 47:14, "Behold, the day shall be as stubble, the fire shall burn them, they shall not deliver themselves from the power of the flame." These are prophecies, and this is a prophecy code meeting. "There will not be a coal to warm at nor a fire to sit before." No coal, no fire, they're going out. If you have any doubts, Jude tells us, "Even as Sodom and Gomorrah are set forth as an example suffering the vengeance,” of what kind of fire? “The eternal fire.” Now some people say, "There you have it, Doug the fire is eternal, it's going to burn forever and ever." Is that what it said? Are Sodom and Gomorrah still burning today? They were burnt with eternal fire, but they were burnt up. Was Sodom and Gomorrah ever rebuilt? Doug: No, it's 4,000 years ago, you can go there today, it's still ashes, they were burnt with eternal fire, the results of the fire are eternal. It doesn't mean that they are still burning, they were cities, not people. I mean, the idea that God's going to burn cities forever and ever is even more absurd, but people seize upon a few misunderstood phrases, and they build a whole theology on that, they blind themselves to the bulk of evidence, and they focus on what they want to believe. Now there are a few difficult scriptures where it uses the word forever, the word that's used there in Greek is eon. Have you ever heard someone say, "Why I haven't seen them in eons?" Eon is an unspecified period of time, it doesn't have a start or a finish, per se. The reason God uses that word is because all the sinners burn different periods based on what they deserve, he couldn't give a specified period. There are other places in the Bible where you're going to find the word forever, and it obviously had an ending. You remember, for instance, when Jonah, in Jonah's time in the fish was compared to the hell that Jesus went through. That Jesus quote is Matthew chapter 12, it says, "Jonah prayed from the belly of the great fish, and he said, “The earth with her bars was about me forever.”” He was in prison how long? You think it felt like forever? What Jonah went through is a good picture of the darkness, and separation from God. Here he is in the bowels of this sea monster at the bottom of the ocean, and it's dark. One day it occurred to me if he was in there alive, maybe that fish had swallowed other things that were still squirming in there with him. Wouldn’t that be awful? Then if you ever do any diving at night, sometimes these fish flash by luminescence, and a little flash octopus, and a jellyfish, it must've been like hell in there. This is how he talked, do you think it felt like forever? Three days, and three nights in the digestive system of a sea monster, but was it forever? The Bible says he was in the belly of the fish three days, and three nights. Again, you can read in Exodus 21, a Hebrew could have a servant for seven years, and after that time, he could go through a ritual where he would stay with his master, and it says he will serve him forever. How long would that be? Till he dies. When Hannah brought little Samuel to the temple she said, "I'm going to leave him here forever." How long was that? Till he died, the rest of his life. Again, it specifies later for as long as he lives. When it says that the wicked are going to be burnt forever, it means the word there, don't forget, it's going from Greek to English, it's eon. They're burnt up according to what they deserve until they die, they're punished, and they're burnt with not only everlasting fire because will they ever live again? Doug: No second chances, it's also called unquenchable fire, and I'll get to that in just a minute. Forever and ever is a Biblical expression which means until the end of the age, not necessarily an infinite, unending length of time. You must read that phrase in its context, because after all, Martin Luther believed it, the father of the Reformation, as did William Tyndale. And a more modern scholar, kind of turned the world up on his ear, John Stott, who is a great scholar. He also believes that the Bible is very clear that the wicked will be burnt up in the lake of fire. 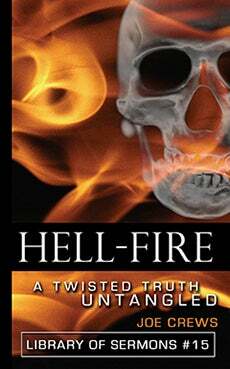 Pentecostal Edward Fudge wrote a book that surprised everybody, he said, "If you're going to go by the Bible, there's no question the wicked are burnt up in the lake of fire." There's a lot of people out there that know this, and they're afraid to say anything because it's considered unpopular. Quick story, it must be 25, 30 years ago, I was driving my little Mazda GLC Japanese car across Texas to the home where we were living at the time, and I saw, Christmas Eve, car was broken down. I pulled over to see if they needed any help, and the man said, "I'm not sure what it is, the lights just started getting dim, and finally the car died." I used to do mechanic work. I said, "It sounds like your alternator." We checked, the battery was stone dead, the alternator wasn't putting anything up. Something very funny, he's driving his big, old Texas Oldsmobile, or something like that, I pulled his car several miles to our house with my Mazda GLC. It was Christmas Eve, I took his alternator apart, it needed new brushes. You men know what I'm talking about, and couldn't do anything about it that night. Invited him, his wife, two girls to stay the night with our family, and got to talking. He’s a Baptist minister. I wanted to study. We started talking about some of the differences in what we believe, and this subject came up. As I shared with him what I've just shared with you, he became very nervous and looking a little edgy. He said, "Brother Doug." He said, "I've seen these scriptures before, and I realize if you're going to go strictly by the Bible, that is pretty clear that hell doesn't burn forever." But then he said, "If I told my church members that, they wouldn't come to church anymore." I said, "Brother, is that why they're coming?" "Trying to stay out of hell." Granted, the Bible does have some very sobering warnings about the lake of fire, and wanting to avoid it, that may be a starting point for anyone in the right mind. Fear of destruction, that's why we don't grab rattlesnakes, it's self-preservation. It might be a starting point, but somewhere along the way if the only reason you're going to church, and serving God is you're trying to stay out of hell, should you ever arrive in heaven, you've lost your motivation. Along the way, we've got to learn to do it because we love the Lord, and we know him. The other reason this subject is important to me, before I learned the truth, I hated God. I wouldn't say that out loud, but in my heart of hearts I thought, "God is mean, he's going to torture these creatures, we're all feeble and weak sinners, and he's going to torture them through endless ages for the sins of this brief lifetime. Why he's a sadist." That's what I thought. When I learned the Bible truth on this subject, it was one of the most liberating subjects I'd ever studied because it helped me see that God is just and He's loving.